Two weeks ago while on vacation, I was at a small, local waterpark, doing the thing that I was born to do when I’m not laying on a couch. As soon as I got my kids set up so they wouldn’t drown, I got myself in the endless cycle of a lazy river. I had somehow managed to squeeze one of those inflatable tubes up over my head, underneath my armpits, and found a way to drag my feet just enough so that I could close my eyes and use the least amount of muscles possible. Besides the non moving position of laying on the couch, this was the most ideal position I could ever think to be in. And yet, even though I managed to lazy river it up for almost 3 hours out of a possible 3 1/2 hours I was in the park, I found ways to be bitter. For some reason they allowed other people in lazy river when I was there. And most of them happened to be those miniature people (I think some people call them kids). The problem with the mini people is that apparently their kindergarten teachers forgot to tell them what lazy means. It’s doesn’t mean to hurry around the circle as fast as you can or step on the toes of a lazy guy blocking your way. They may not know it yet, but I have cursed them all to be bitter like me when they grow up. When I wasn’t being interrupted by the elves and the constant ringing in my ears from their screaming, I was thinking about the fact that no matter how comfortable I tried to get on the lazy river, there was always something aching, throbbing or nagging. Bitterladies and Bittermen, I am a living, barely breathing life sized Operation Game, complete with the bitter, angry look on his face. In fact, you could say that my body is a perfectly balanced machine of pain. It is perfectly engineered to give me the maximum amount of pain at all times. Behold, the bitter angry face. 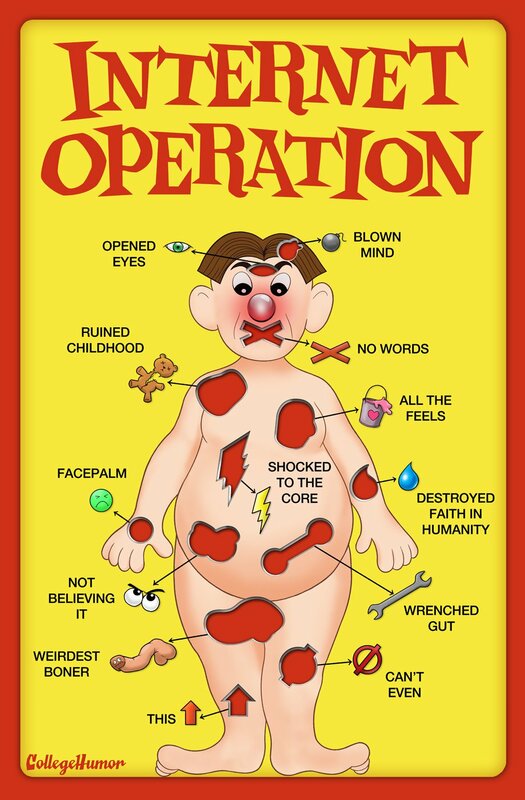 Since I have so much pain, I’m going to allow all of you to experience the pain I have on a secondly basis, by allowing you all to play a game of Operation: Bitter Ben, by listening to me complain about each and every pain I have. By the end of this, you will probably want to gouge your eyes out(if you do it sucessfully, that is another point for you). Grab your little tiny metal tweezers, and play at home as I describe my pain. If you remove all the parts on your play at home board without touching the sides and electrocuting me, you will win a brand new game, which you will need to go to the store and buy yourself(do I look like I have any money?) Alright,ready? My Big Toe – When I was in the lazy river, I was trying to allow it to be dragged on the bottom of the pool, but kids kept trying to pass me and they were automagnetically attracted to my big toe. That would in turn lead to my famous Bitter Grimace. The best part about my big toe pain is that it isn’t quite broken, just sprained enough that the nagging, just like your co-workers, just never seems to go away. Don’t you hate it when the nagging pain just doesn’t go away? My heels – When playing basketball a few years ago(and by a few, I mean 5) I would wake up in the morning and my heels would hurt. In fact, they would hurt so bad that I had to crawl to the shower in the morning. So of course, I immediately retired from basketball, only to unretire the next week, when someone convinced me to play again, reassuring me that the pain would go away. Until it didn’t. Knees – Being the tall guy that I am, I of course choose the sedentary and wonderfully small spaced living of a cubicle job. Because who doesn’t want their long legs to be perfectly cramped into space day after day? Of course, my original old abuser basketball didn’t help with the knees. I guess for some reason when you run up and down a basketball court, requires the ritual sacrifice of your knees. Ankle – Along with learning the fundamentals of basketball like passing, shooting, and dribbling, I also learned how to best step on other player’s feet. One time, I landed so perfectly that the guys I was playing with were provided with enough entertainment value to half laugh and half grimace to the point that they wished they had their cameras to record it so they could upload it to YouTube. I’m beginning to think that maybe I shouldn’t have been so tall, so I wouldn’t have been subjected the dangerous world of basketball. How are you doing in your Operation:Bitter Ben Game? Touched the metal sides yet? Well, we aren’t finished yet. Elbows – I always thought that your elbows weren’t supposed to hurt; just make you laugh every once in a while when you hit your “funny bone”. I guess my have a special bitter bone, because mine make me bitter every time I bump them. Heartburn – I know I have no heart, but I thought you could put a little water on something that was burning and it would go away, but when even water gives you heartburn, then maybe something is wrong with you? Chins – I was born with only one. But the older I got, the more chins I keep adding. Is there some barometer like one chin per decade, because it appears like I have 4 now. Hair – My hair. It hurts all the time. I thought hair was dead. I guess it is so mad at me for not taking care of it, that it is starting to leave and go other places. My ears never asked for that stuff. Ears – My ears must be mad at all that hair being pushed on it by angry head, because there is a constant ringing. Or maybe that is just the high pitched squealing of the neighborhood kids. Alright, apparently everyone did really bad, because I feel like I just got hit by lightning. Did you buzz me on purpose? Oh, I forgot one more. While I was contemplating all the pain on the lazy river…I forgot to reapply sunscreen and now I have a sunburn. Thanks a lot for that. Glad to see you made sure your kids were safe before you made yourself miserable. I always look out for my kids first, except when I don’t. Oh dear! Pain Pain go away! I’m afraid all the drugs in the world aren’t going to be able to take away all the pain. Need Heisenberg. Actually, I never watched Breaking Bad. I guess I will have to at some point or I won’t be allowed to be a part of the human race. I was threatened with the same thing. That’s the only reason I watched it! And did you find it to be bitter? That waterpark was crazy that day. It was also causing traffic to back up too. I prefer a little less crowded lazy river. You bet it is. We get all kinds of pains. This list is long and getting longer. As we speak, my pain is in bitter pain, my heartburn is acting up and my carpal tunnel is crippling my typing hands. I feel your bitterness, Ben. Being an incredibly clumsy person I’ve hurt about everything there is to hurt. I’m starting to think that I might be the Samuel L. Jackson character from Unbreakable. You know the bitter villain? It was kind of painful though. I was so bitter to find out that I had a sunburn. The stupid clouds were hiding the sun, so I thought that they wouldn’t burn me. Stupid sun and it decietful burning. I only listed a few of my bitter pains. I didn’t want to bore people with everything. Whoops already did. You’re right. I pretty much nailed that post. Some things fell down the cracks. b/c you are so skinny too? I wouldn’t even fall into a crack created by an earthquake. Which one? He’s in a lot of them. You are supposed to read my mind. I should have been fired from mine a long time ago. They would have to work to hard to find out why. You bitter win. Or you will definitely have something to be bitter about . Well, my ex making fun of the death of a child (my boyfriends son) has pretty much cleared the path for me. He’s a sick man, and I wouldn’t be surprised at all if the judge ordered a CPS investigation into their lives, as they have 3 children in their house. apparently a child dying is funny to them. SICK!!! But thank you. I’m confident I will win, as he put it in writing that he has no interest in being a part of my son’s life. I’m a pretty bitter person, but I’ve never wished death on a child. Or a person for that matter. Go deliver a judicial smack down on him. Oh… it’s on. I asked the judge that if I’m for some reason NOT awarded sole custody, that he have a psychiatric evaluation, as it takes a SICK person to poke fun at the death of a child, and I’m not comfortable leaving MY child alone in his presence. The petition was 20+ pages, including all the hate mail he sent me, as well as my kind responses looking for a peaceful resolution. He doesn’t have a leg to stand on. He put it in writing that he’s done with our son. For us to move out of state. I’m just sitting back watching this poor excuse of a man hang himself and PRAYING to God my boyfriend doesn’t find out that such comments were made, as he is still very much grieving the loss. I can appreciate your bitterness (customer service) but your response in itself is supportive, so I thank you for that. I have a feeling you will win. Not sure why though..you barely have a leg to stand on. I have a slew of hate emails from him and his girlfriend, and ALL of my sickeningly sweet responses seeking a peaceful resolution. And the only reason I don’t have a leg to stand on is because I just had surgery… on my leg. I don’t even have to talk when we enter the courtroom. I just sit and listen as this “man” keeps digging and digging… well, here’s your shovel buddy. You are going DOWN!!! Why would you reply with such niceness? I would go for passive aggressive. That is the best kind of passive aggressiveness. The one that can’t be proven in the court of law. An awesome amount of pain, yes.